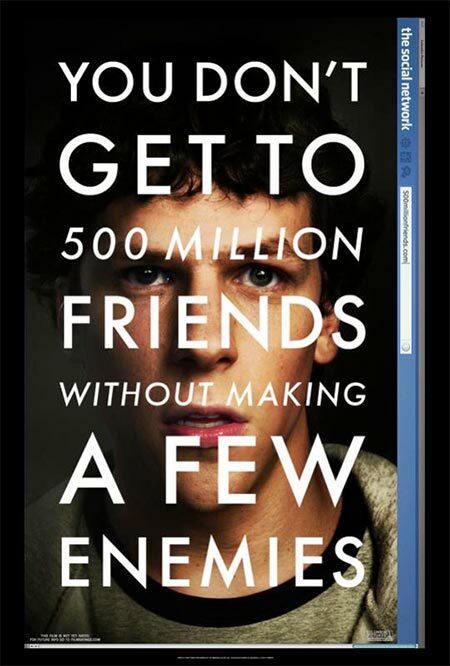 A fact based telling of the story surrounding the creation of the social networking website, Facebook. Making a movie about Facebook doesn't immediately say this is something we must see, but the finished product is very much exactly that. When I first heard of this project, I scoffed. I thought (like so many others) a movie about Facebook, big whoop. Then talent began to form around the project. Names like David Fincher, Aaron Sorkin and Jesse Eisenberg. These three names were all game changers for me and my interest levels. From that moment on, I knew that "The Social Network" was a must see movie. Thankfully "The Social Network" lives up to the hype I set for myself. In fact, technically, this is the best film I've seen this year. The film is immaculate. Everything from the script, cinematography, editing, score and performances are magnificent. This movie almost feels like a blueprint on how to make a flawless biopic. Now how true everything throughout the film is can be left open to interpretation, but the fact remains how brilliantly it is told and executed. Director David Fincher is film by film becoming a legend. The man is creating a catalog of films that are absolutely staggering. What's more is the director isn't just sticking to one genre, but instead he is jumping around proving his worth in each genre he tries. His main focus has seemed to be thrillers with films like Se7en, The Game, Fight Club, Panic Room and Zodiac but then he's gone on and done fabulous work in the SciFi genre with Alien3 not to mention the more simple dramas like The Curious Case of Benjamin Button and now "The Social Network." Fincher knows how to make quality films regardless of the genre and The Social Network is just another bold example of that. One important aspect to "The Social Network" being such a fabulous film is the detailed and meaningful script penned by Aaron Sorkin. Sorkin like Fincher, is a genius. Most of my praise of Sorkin is centered around his work on the television series The West Wing, but his other screenplays are also equally powerful. Sorkin's script is able to weave in a story about one person's desire to fit in/be important while also being ultimately clinical. The script is a dissection of the legal and historical breakdown of what made Facebook, but it is also a very personal film that delves into the friendships made and destroyed through the creation of the website. I love that the film houses a thoughtful interpretation of Mark Zuckerberg's emotions combined with a ton of wit while also being a straight-forward telling of how Facebook was invented. On to the performances. It would be a travesity to not mention three names; Jesse Eisenberg, Andrew Garfield and Armie Hammer. These three (technically four) do an outstanding job within the film. I say four because Armie Hammer brilliantly plays dual roles as the Winklevoss twins. Hammer is perfect and Fincher does a stellar job of making this movie making trick seem transparent. Honestly I did not know that Hammer plays both roles until after seeing the film. Furthermore I was blown away reading the news after seeing the film opening weekend. Andrew Garfield illustrates why he is an up and coming actor that is sure to get plenty of work as his career grows. The twenty-something has landed the role of Spider-Man in the upcoming re-boot and rest assured, he's got the talent to fill those shoes. Garfield comes across as the outsider throughout "The Social Network" and watching as he is pushed to the side is very bitter-sweet. You can feel the resentment build, which is a testament of how well the film is put together, told and acted. Jesse Eisenberg is one of my favorite young actors working in Hollywood. The kid has it. While it may seem that he has stuck to fairly similar roles, he has an enormous amount of talent just waiting to be utilized. Eisenberg's performance is unerring but comes across as sterile. This is a testament of both Eisenberg's raw talents and Fincher's ability to channel them. Eisenberg playing Zuckerberg is not an easy feat. Mark Zuckerberg is something of a savant. He is extremely intelligent and arrogant. His personality is furthermore endlessly stale yet he is absolutely fascinating. Eisenberg nails every facet of Zuckerberg's demeanor, so much so that it wouldn't surprise me in the least if he lands himself some nominations come award season. This review would feel entirely unfinished in my eyes if I did not pay some respect to the original music created by Atticus Ross and Trent Reznor along with the film editing by Kirk Baxter and Angus Wall. I'll first mention Reznor and Ross's fabulous score. It is tremendously subtle. Something I never expected from Trent Reznor. What I found so enthralling about the score though is how very subtle it is while being magnificently elaborate and entrancing. On the editing side, this film is pieced together masterly. It does a staggering job of hammering home a simple message at the beginning and end of the 121 minute drama. The most notable work however is between the varying depositions. These sequences are masterly put together and ultimately gave us a fresh take on a tired situation from film with legality issues. In closing I'd like to cover how male heavy the film and script are. In every way "The Social Network" revolves around men. All of the central characters throughout the film are male and nearly every female shown is portrayed in a misogynistic light. They are in every way objects of desire throughout the film. Now at first this may just seem like a chauvinistic angle to the film, but at its core, in no way is that the case. Mark Zuckerberg created Facebook to create status for himself. He craved belonging to a elite society. He also wanted to impress a girl. His motives may not have been aimed at anything other than desire and notoriety but the results of his creation are far greater than his original motives ever were.